The optical transceiver Module used for optical-to electrical conversion is a key component in optical communication systems. Fibre Optic Transceiver Module is a self-contained component that can both transmit and receive. Usually, it is inserted in devices such as routers or network interface cards which provide one or more transceiver module slot (e.g GBIC, SFP, SFP+, XFP). SFP module is a compact optical module used in optical communications. The SFP is short for small form-factor pluggable and also called Mini-GBIC (the upgrade version of GBIC). The SFP module has many applications in both telecommunication and data communications. This article focus on picking SFP transceivers for Cisco 3560 switches. The Cisco Catalyst 3560 series is a line of enterprice-class switches that include support for PoE, Qos, And advanced security features such as ACLs. These switches, shown in Figure 1, are ideal access layer switches for small enterprise LAN access or branch-office converged network environments. 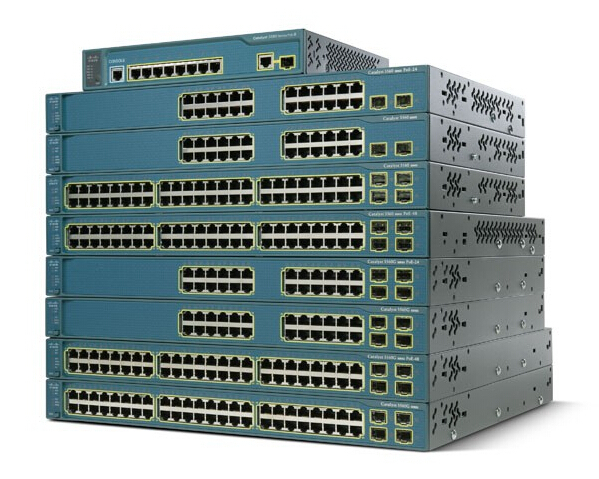 Since this article is discuss module options for Cisco 3560 series, to learn more about the Catalyst 3560 series of switches, see the data sheet of Cisco Catalyst 3560 series. The Cisco switch product lines are widely deployed globally, in large part because of the flexibility they provide for add-on options.not only does the Cisco IOS have the richest set of features available relative to any other network operating system, but the IOS is also tailor fit to each Cisco networking device, switches in particular. To illustrate the options available, which are literally too voluminous to list here, we focus on the Catalyst 3560 switches. The Catalyst 3560 switches have Small Form-Factor Pluggable (SFP) ports that support a number of SFP transceiver modules. 40 Gigabit Ethernet and 100 Gigabit Ethenet modules are supported on high-end Cisco devices, such as the Catalyst 6500, the CRS router, the ASR 9000 Series router, and the Nexus 7000 Series switch. This entry was posted in Fiber Optic Transceivers and tagged cisco 3560, cisco 3560 sfp, SFP module, SFP-10G-LR, SFP-10G-SR on December 9, 2014 by Admin.